Rep. 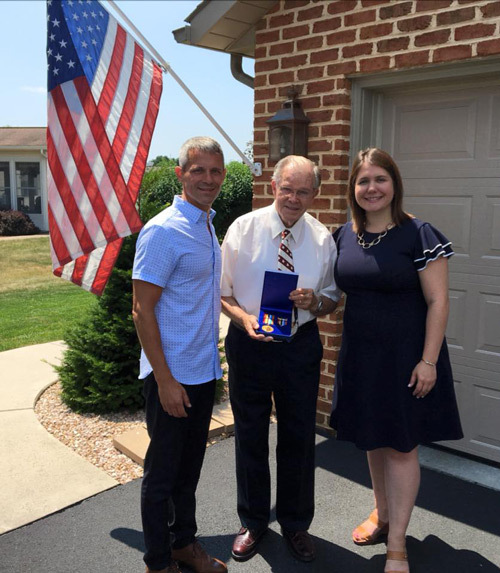 Rob Kauffman (R-Franklin) joined Larissa Bailey from U.S. Sen. Pat Toomey’s office in presenting the Ambassador for Peace Medal to Korean War veteran Johnny Parson. HARRISBURG – This week, Rep. Rob Kauffman (R-Franklin) joined the office of U.S. Sen. Pat Toomey (R-PA) in presenting the Ambassador for Peace Medal to Korean War veteran Johnny Parson. The Ambassador for Peace Medal is a commemorative medal of appreciation from the Korean government to American veterans who served in the Korean War. Parson served in the United States Army from Dec. 2, 1952, to Sept. 1, 1954. He was a sergeant with the HQ 3rd Infantry Division. He received the National Defense Service Medal, United Nations Service Medal, Good Conduct Medal and the Korean Service Medical with one Bronze Service Star. Parson resides in Chambersburg with his wife, Elizabeth, of 63 years.